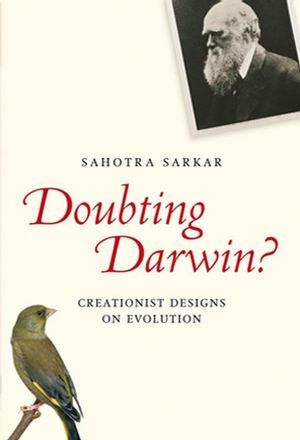 Noted biologist and philosopher Sahotra Sarkar exposes the frauds and fallacies of Intelligent Design Theory, and its claim to be ‘good science’. Sahotra Sarkar is Professor of Integrative Biology and of Philosophy at the University of Texas at Austin. He is author of Genetics and Reductionism: A Primer (1998), Molecular Models of Life (2004), and Biodiversity and Environmental Philosophy (2005); editor of several books, including The Philosophy and History of Molecular Biology (1996), the six-volume Science and the Philosophy in the Twentieth Century: Basic Works of Logical Empiricism (1996), and co-editor of the two-volume The Philosophy of Science: An Encyclopedia (2005). b. The Evidence for Evolution. d. Plan of the Book. 2. The Legacy of Darwin and Wallace. a. The Theory of Natural Selection. b. “Absurd in the Highest Possible Degree”. e. The Decline of Darwinism. 3. The Argument from Design. b. Function, Design, and Selection. b. The Modern Framework for Evolutionary Theory. 5. The Cost of Lunch. b. The “No Free Lunch” Theorems. c. The Citric Acid Cycle. d. The Blood Clotting System. a. What is Biological Information?. d. The Law of Conservation of Information. f. Taking Leave of Creation Biology. c. The Force of Improbability. d. A Cosmological Design Argument. 9. Naturalism and Its Discontents. c. The Problem of Normativity. a. Critiques of Evolutionary Theory. c. Back to the Classroom.